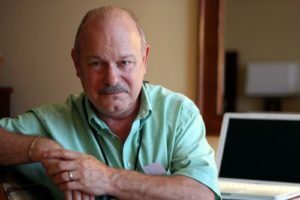 An hour-long conversation with Joe Haldeman, Hugo and Nebula Award-winning author of The Forever War, The Hemingway Hoax , Forever Peace and many others (more than two dozen), a SFWA Grand Master and a member of the Science Fiction Hall of Fame. Joe has also won the John W. Campbell Memorial Award, the Locus Award, the Rhysling Award, the World Fantasy Award, and the James Tiptree, Jr. Award. Joe William Haldeman (born June 9, 1943) is an American science fiction author. He is best known for his 1974 novel The Forever War. That novel, and other of his works, including The Hemingway Hoax (1991) and Forever Peace (1997), have won major science fiction awards, including the Hugo Award and Nebula Award. He is a Science Fiction and Fantasy Writers of America Grand Master and was inducted into the Science Fiction Hall of Fame in 2012. Joe was born in Oklahoma City, OK. His family traveled, and he lived in Puerto Rico, New Orleans, Washington, DC, Bethesda, MD, and Anchorage, AK, as a child. In 1965, Haldeman married Mary Gay Potter, known as “Gay.” He received a Bachelor of Science in physics and astronomy from the University of Maryland in 1967. He was immediately drafted into the United States Army and served as a combat engineer in Vietnam. He was wounded in combat and received a Purple Heart. His wartime experience was the inspiration for War Year, his first novel; later books such as The Hemingway Hoax and Old Twentieth have also dealt extensively with the experience of combat soldiers in Vietnam and other wars. 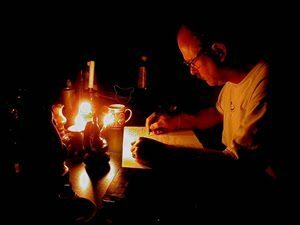 In 1975, he received an MFA degree in Creative Writing from the University of Iowa Writers’ Workshop. Haldeman resides in Gainesville, FL. For thirty years, he was an Adjunct Professor teaching writing at the Massachusetts Institute of Technology, which is also the fictional setting for his 2007 novel, The Accidental Time Machine. In addition to being an award-winning science-fiction writer, Haldeman is a painter and poet. 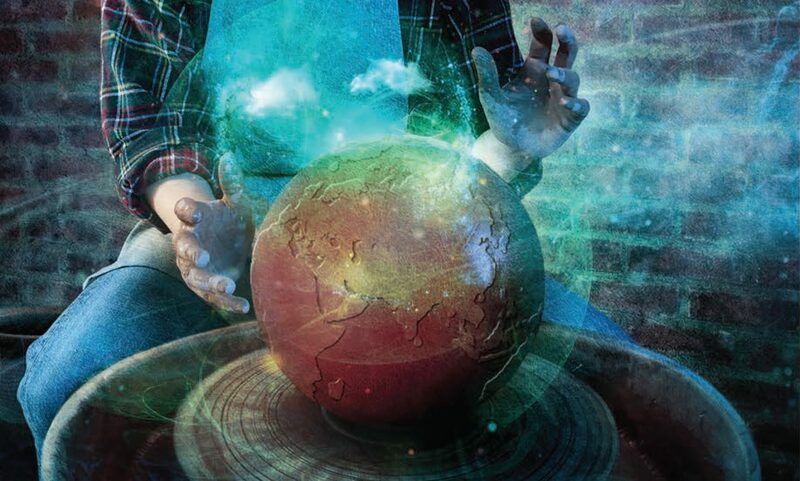 Your host first met Joe and Gay Haldeman at a convention in Calgary, as has been the case for several authors interviewed on The Worldshapers. Joe started reading SF at around age eight or nine, when his father would come back with travels with books for both Joe and his brother, Jack, usually Norton science fiction novels. The one joe remembers the best is Rocket Jockey by Philip St. John, a pen name for Lester del Rey: basically, Grand Prix racing in outer space with rockets instead of race cars. Joe was always interested in space and astronomy. There was no space travel until he was a teenager, and, he says, he was ready for it. “I don’t know what they were waiting on. Invent those rockets, I want to get into space!” He got his first telescope in Grade 4. While in the service he wrote long letters home, which eventually took the shape of a war diary, with the notion that Gay, whom he married in 1965, would keep the letters in order, so that when he came back, he could assemble them into a book about Vietnam. He came back as a disabled war vet, and his first book was indeed about the war. War Yearwas written as part of a series of books for young readers—18, 19, or 20 years old—with limited reading abilities. He was given a vocabulary list of 1,000 words he could use, along with whatever technical terms he needed. He says it was an interesting challenge, and not a bad idea for a beginning writer. “Art thrives under restrictions,” he says. 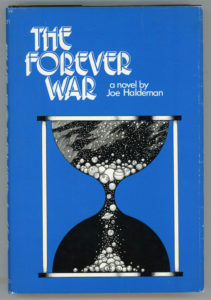 The Forever War was essentially his master’s thesis at the University of Iowa. “The academic establishment, if you can call it that, thought I was crazy to write a science fiction novel,” he says; they saw that as children’s literature. Ed mentioned One Lucky Devil: The First World War Memoirs of Sampson J. Goodfellow, his grandfather-in-law’s First World War memoirs, which he just edited and published through his new publishing company Shadowpaw Press. The powerful notion at the center of The Forever War: taking his Vietnam experience and treating it as a metaphor, about going to another world and being changed by the relativistic aspects of spaceflight, coming back to a world that’s completely different because so much time had passed. The title came about in conversation with his brother, Jack C. Haldeman (who would also write science fiction). He told his brother during a car trip about the idea, and wondered what to title it. His brother said, “How about, ‘The War that Went Forever,’ which became The Forever War. Joe gave the synopsis: a young man trained to be a scientist is snatched by the political system he’s in and made into a soldier against his will. He goes through the usual military rites of passage and comes out the other end rather beaten up and older and not sure what he’s going to do with his life. He meets a girl, as a fellow soldier (a big new idea at the time, Joe says), and they have to face life after the war. Joe says he was written books both from very detailed outlines (some early projects, which proved to be pretty good training) and, mostly without. 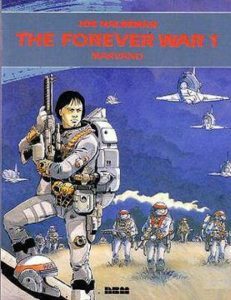 The Forever War, he notes, was actually written as a series of novelettes. He was writing for a living, needed to make money, and knew he could sell novelettes to Analog (formerly Astounding). John W. Campbell was the editor there when he started, but Campbell died while he was writing the series. Fortunately, the new editor, Ben Bova, suggested he continue—which he did. The editor said to create an outline for the book and send it over. He bought it, and published it, and Joe’s career was on its way. He mostly writes long-hand. “I like the fluidity of handwriting,” he says. However, some books are a mix of handwriting, typing, and computer printouts. Fortunately, he says, his handwriting is very legible, although he doesn’t know where that comes from. In Calgary, Joe talked about the community aspect of SF. He agrees, a lot of SF writers find a family within the genre, although he thinks that may be less true now because there are so many more science fiction writers and so many subgroups. When he was treasurer of SFWA, there were only about 175 members, of whom only about half were fulltime writers. Now he guesses the total membership is around 5,000, and probably 1,000 call themselves SF writers as their main profession. Joe notes people wanted a sequel from the very beginning, even though he thought the book didn’t need a sequel. “They kept pestering,” he notes, “and there was this soft rustling sound of folding money.” That was a big part of it, he says, as well as the appeal of writing a book that he wouldn’t even have to sell. “You just say, this will be a sequel to The Forever War and people will come to you with check books.” In the end there were two sequels, Forever Peace (a thematic sequel) and Forever Free (a direct sequel). There has also been a stage play, produced by Stuart Gordon, with whom Joe also worked on the movie Robot Jox. The basic idea of that, Joe says, was “huge clanking robots that had people inside them,” the was somewhat inspired by Transformers. He notes the original title was RoboJox, but someone thought that was too close to RoboCop. His current project inverts a classic SF situation. As Joe explains it, your basic SF hero is a guy, about thirty years old, involved in some sort of an adventure job, he does things that requires facing danger and going into exotic locales and interacting with bad people and doing stuff and being a hero. His work as a writing instructor at MIT started as a one-semester job and extended for thirty years, when he retired himself. He liked teaching engineering students, he said: “They’re my kind of people.” He also confirms something Ed (married to an engineer) has heard from his wife—that engineers can’t spell. As to whether his writing has had any impact on the world, Joe says he hopes it has made people “more sane and forgiving in dealing with other people,” although he notes he’s met some of his readers who are crazy and think he is crazy, too.